Be the first to share your favorite memory, photo or story of Autumn. This memorial page is dedicated for family, friends and future generations to celebrate the life of their loved one. 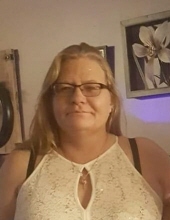 Gloria Autumn Marshall, age 40, resident of Newkirk, Oklahoma, passed away Thursday, January 24, 2019, at her home. A celebration of Autumn's life will be held at noon on Monday, January 28, 2019 in the Lodge at Camp McFadden, east of Ponca City. Those attending are requested to bring a side dish to share in one of Autumn's favorite activities, eating. Cremation arrangements are under the direction of Trout Funeral Home & Crematory. Autumn was born on October 31, 1978 to John Albert Marshall and Gloria Rose Marshall in Wichita, KS. Autumn was born with a heart of gold. Her care for people in her life sometimes came at a disservice to herself, but it was that concern for others that brought her joy. Regardless of Autumn's own state in life, she often reached out to her beloved family to see how they were and to keep in touch. Autumn always had the radio on; listening to whatever was playing and singing her heart out along with the song. With an uncanny ability to remember lyrics, Autumn could sing the songs word for word. Word puzzles also kept Autumn busy as she expanded her vocabulary and kept her wit sharp. Survivors include her cherished sons: Timothy Willeman of Houston, TX, John Willeman of Newkirk, OK, adored parents, Gloria Emerson and husband Tom of Kaw City, OK, and John A. Marshall, Jr. of Wichita, KS, siblings: John Marshall, III, Jason Marshall, Jesse Marshall, Jody Marshall, Deborah Marshall, Nancy Garcia, Vanessa Trumpower, Kyle Marshall, Shawn Sherman, and Chelsea Wiggins, paternal grandfather John A. Marshall, Sr., as well as many aunts, uncles, cousins and dear friends. Autumn was preceded in death by her maternal grandmother, Betty Fuller and paternal grandmother, Mary Marshall. To send flowers or a remembrance gift to the family of Autumn Marshall, please visit our Tribute Store. "Email Address" would like to share the life celebration of Autumn Marshall. Click on the "link" to go to share a favorite memory or leave a condolence message for the family.